Are you tired of your dull countertops? Stonecrafters has the solution! Granite countertops are a long-lasting way to add beauty and elegance to your home or kitchen. Rich with texture and natural color variations means that no two will be the same. We use only premium granite for our granite kitchen countertops ensuring that you will have the best of the best, and the strength and resistance that you expect from premium imported and domestic granite. Stonecrafters strives to bring exceptional quality and value with unmatched service and satisfaction. In addition to the natural beauty of Wauconda, you can enjoy enhanced beauty in your home or office with creatively designed granite counter tops from Stonecrafters. Not only beautiful but long-lasting and durable, making them a perfect option for the highest return on your investment. Wauconda is home to just more than 13,000 residents who know that the preferred choice for granite countertops in Lake County, Illinois and the surrounding area is Stonecrafters for over 20 years. Our craftsmanship is second to none, find your ideal granite countertops today! When it comes to building your new home or updating your home, a practical step is installing premier granite kitchen countertops from Stonecrafters near Wauconda. 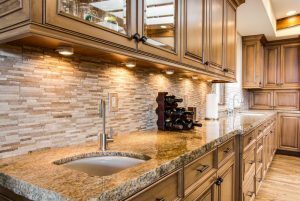 Granite counter tops have been around for decades and are here to stay! Granite is made from natural stone which means each slab is unique and beautiful and adds elegance to any room or décor. Granite counter tops are original natural works of art. When you are ready to take the step to granite kitchen countertops, one call to Stonecrafters is all it takes! Call us today at (815) 363-8730.